2. Strategies to ensure the long term sustainability of the eco toruism industry here in Crystal River. Finger food and refreshments will be provided and the mayor's session will be followed by our monthly business meeting. MANATEE ECO-TOURISM ASSOCIATION OF CITRUS COUNTY, INC. 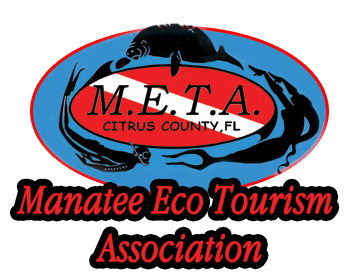 The name of the organization is the Manatee Eco-Tourism Association of Citrus County, Inc., Hereafter referred to as META. The principle office shall be in Citrus County, Florida. The Corporation is formed and operated as a domestic 501(c)(3) charitable non-profit publically supported organization under the applicable provisions of Florida State Law consistent with Internal Revenue Code 501(c)(3). Section 1. Purpose: The purpose of the Corporation shall be to educate, create public awareness, advocate and support the preservation and survival of the manatee population in Citrus County. Section 2. Mission: The corporate mission shall be educational, offering lectures, tours, other educational events, related merchandise, products and services that support and enhance public education and awareness of the manatees in Citrus County. Section 3. Tax Exempt Status: The affairs of the Corporation shall at all times be conducted in such a manner as to assure its status as a “publically supported” organization as defined in section 509(a)(1) or section 509(a) (2) or 509(a) (3) of the Internal Revenue Code to qualify for exemption from tax pursuant to section 501(c) (3) of the Internal Revenue Code. Said organization is organized exclusively for charitable, religious, educational and scientific purposes, including for such purposes, the making of distributions to organizations that quality as exempt organizations described under Section 501(C) (3) of the Internal Revenue Code, or corresponding section of any future federal tax code. The principal office of the corporation will be located at 531 N E 13th Street in Crystal River, Florida, 34428. Other locations in Citrus County, from time to time, may be established by the board of directors. Membership in the association shall be open to individuals, business entities and organizations involved in eco-tourism, public education including tours, lectures and events that support eco-tourism and the preservation of the manatees in Citrus County. The board of directors shall manage the business of the corporation in accordance with all laws and regulations governing the operations of a 501(c)(3) Non Profit Corporation, applicable Florida Laws and the META By Laws and Articles of the corporation. The number of members of the board of directors shall be a minimum of 5 to a maximum of 9 directors, unless a majority of the board of directors shall deem otherwise. Election of the board of directors shall occur during the annual meeting to be held during the month of November of each year. Nominations for each open position will occur at the October meeting. The directors’ terms will commence in January. Members must be active in META for the 12 months preceding elections. Directors will be elected by a simple majority of the members and serve a two year term. Any director can be appointed after a two year absence from active directorship in the current position. In the absence of a director because of death, resignation, removal or other circumstances, the board may elect or appoint a new director to serve for the duration of the unexpired term. Any director may be removed from the board of directors, with or without cause, at any meeting after a reasonable notice has been provided by a simple majority of directors present by the affirmative vote of the directors. No compensation or inurement from net earnings or investments may be paid to any member of the board of directors consistent with the IRS Tax Code for a 501(c) (3) Non Profit Corporation. Reasonable expenses however, may be reimbursed for any meeting, event or program attended or project completed that has been approved by the board of directors and is in the best interest and within the purpose META. The board of directors may hire, appoint, employ and compensate individuals or consultants, beneficial to the corporation as permitted under all applicable laws and regulations for a non profit. An annual meeting of the members shall be held each year during the month of November to elect officers and directors as needed, report on META activity, transactions and business, discuss and vote on any other items of importance to the corporation. The annual meeting may be held at any location as determined by the board of directors. The positions of President, Secretary and Treasurer will be elected in odd number years (e.g., 2015). The positions of Vice-President and Parliamentarian will be elected in even numbered years (e.g, 2016). Terms of office will start in January after the election. Regular meetings of the board may be monthly or as often as deemed necessary by the board. Special meetings of the board of directors may be called by a majority of the board of directors at any time providing reasonable notice is provided to the directors. Any topic(s) can be presented for discussion as deemed important by the board of directors. A majority of the board present at any meeting shall constitute a quorum for voting purposes. Each director shall have one vote and vote by proxy shall be permitted. Roberts Rules of Order may be used at any meeting to keep procedural order if and when appropriate. Section 1: The officers of the corporation shall be the President, Vice President, Treasurer and Secretary and a Parliamentarian. The president shall be the chief executive officer of the corporation. It will be the presidents duty to reside at all meetings of the board of directors, supervise the affairs of the corporation, execute all contracts and other instruments on behalf of the corporation for the proper and necessary transaction of the business of the corporation. The vice president shall assist the president and carry out the duties of the president whenever the president is unable to perform them. The secretary shall be responsible for keeping the corporate records, give notice of meetings as required by the by-laws, record the minutes of corporation meetings, be responsible for all books, correspondence and documents relating to the business of the corporation as required by appropriate law or corporation by-laws, except when they are the responsibility of the treasurer. The secretary shall also provide any reports, transactions and affairs of the preceding year at the annual meeting, prepare any and all reports required by the board of directors, except were those reports remain the duty of the treasurer. The treasurer shall have charge of finances of the corporation, will endorse all checks, drafts, notes and other obligations of the corporation and show evidence of payment for obligations of the corporation. The board may designate limits on disbursement amounts without prior approval. The treasurer will receive and deposit all funds, money and other payments to the corporation and document all with proper receipts to the bank selected by the board of directors. The treasurer shall keep full and complete records of all moneys received and all disbursements made, present a periodic record of all financial transactions to the board and present a complete statement of all financial transaction at the annual meeting for review and approval of the membership. and voting and at all times, adhering to efficient, orderly and productive meetings. The Board of Directors may form an Executive Committee consisting of the four officers. The executive committee may act for the full board as needed to conduct the corporations' business in an appropriate and timely manner. The board may create and define the powers of committees, Ad Hoc, temporary or standing, as it deems appropriate. Each committee established shall have one director as its chairperson. The chairperson so appointed may appoint any existing member of the corporation, in good standing, to service on the committee. The board shall retain the power to approve all committee members, approve committee recommendations and dissolve or terminate any committee when its’ work assignment is complete or deemed no longer necessary. All committee members will have advisory only powers and the committee chairperson shall report their recommendations to the board of directors for approval and board action. The corporation shall have the power to indemnify and hold harmless any director, officer, employee, committee member or agent or consultant from any suite, damage, claim, judgment or liability arising out of, or asserted to arise out of, conduct of such person in his or her capacity as a director, officer, employee, committee member, agent or consultant except in cases involving willful misconduct and criminal acts. The corporation will have the option to purchase or procure insurance for such purposes. The board of directors may authorize any officer, director or agent of the corporation to enter into any contract or execute and deliver any instrument in the name of and on behalf of the corporation. Such authority may be general or confined to specific instances. All checks, drafts, and other orders for payment of funds will be signed by two officers one of which shall be the president or treasurer and one other officer. The corporation shall keep correct and complete books and records of accounts and will also keep minutes of the proceedings of the board of directors and committees meetings having any authority from the board of directors. Records and books of account shall be kept at the registered or principal office of the corporation. The business year of the corporation shall begin on January 1st and end on December 31st. The META board of directors may amend the By Laws to alter, include or omit any provision that it may lawfully include or omit at the time an amendment is made at any meeting of the board when a quorum is present. Upon the dissolution of the corporation and after the payment or provision of payment of all the liabilities of the corporation, the board of directors will dispose of all of the assets of the corporation exclusively for the purposes of the corporation or to the organizations that are then qualified as a tax exempt organization under section 501c 3 of the Internal Revenue Tax code. Any assets not so disposed of will be disposed of by a court of jurisdiction in the county in which the principal office of the corporation is located. Reproduction in whole or part without permission is prohibited. All rights reserved.